If you're wondering what it takes to become a Certified Tile Installer (CTI), you've come to the right place. 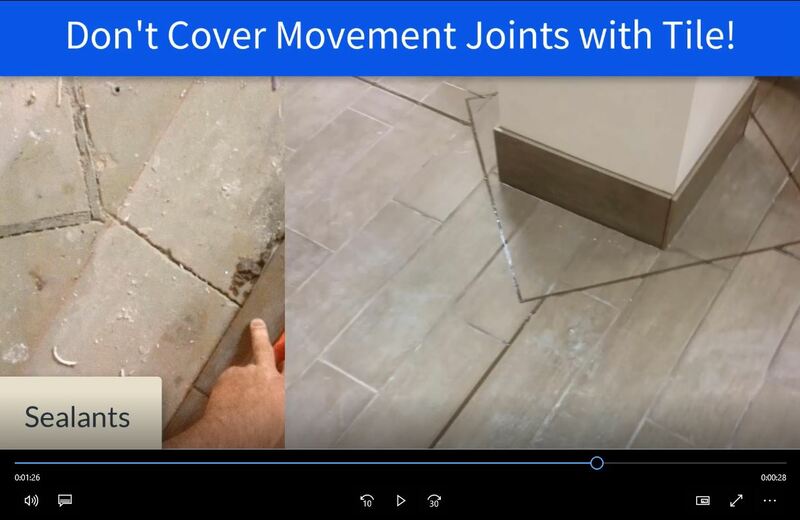 We have just completed an eight-video online prep course that illustrates tile installation best practices that are expected of Qualified Labor. Because, when you become a Certified Tile Installer, you also become Qualified Labor. We'll also discuss Qualified Labor a bit more. What's in this Free Online Prep Course for Installing Tile? This free online prep course consists of eight videos that explore each topic in some depth, while calling attention to the corresponding sections of the CTI Manual (which you receive when you register for the CTI program) and other important tile installation reference materials. In the safety module you will learn about job site safety along with the government requirements under the Occupational Safety and Health Administration (OSHA). In this module, you will learn about vapor retarding membranes. In this module you will learn about the different types and recommended usage of backer boards. In this module, you will learn about tile installation on walls. In this module, you will learn about tile installation on floors. In this module, you will learn about proper grouting practices. In this module you will learn about sealant joints and their proper placement. Time management may be one of the most crucial aspects of the entire program. That's why we created this module which teaches how to make better use of the time allotted for the CTI hands-on test not to mention the everyday jobsite. Watch the Two-Minute CTI Prep Course Overview! Here's the two-minute over video of the CTI Online Prep course. At the beginning of this article, we mentioned that we'd discuss Qualified Labor. If you consider yourself a serious, professional tile installer or mechanic, you want to be considered Qualified Labor. Qualified labor refers to having the most qualified professional perform the scope of the work specified rather than basing the decision on the lowest price. Because tile is a permanent finish, the lowest bid should not be the driving factor for hiring a tile installer, but rather who is the most qualified to perform the scope of the work specified. From a technical perspective, qualified labor means having successfully demonstrated a tile installer's skills that meet tile industry standards and best practices. That is what the Certified Tile Installer (CTI) program does. The CTI designation identifies the professional installer who has reached a level of proficiency to independently and consistently produce a sound tile installation that displays good workmanship. It is the only third-party assessment of tile experience and knowledge. Certified Tile Installers routinely demonstrate the knowledge, skill, experience, time management abilities and other traits needed to produce high quality, long lasting, successful installations using Tile Industry standards and methods along with time-tested proven best practices which are in place in the United States. Any tile installer may take the Certified Tile Installer (CTI) exams if he or she has at least two years of experience as the lead installer setting ceramic tile on a full-time basis. That means having full responsibility for substrate prep, layout, coordinating with other trades along with properly installing underlayment, tile, grout and sealant materials. If you're wondering if you have what it takes to become a Certified Tile Installer, you'll want to take this eight-video online prep course. Are You Interested in our Free Online Prep Course? >> What Does It Take to Be a Certified Tile Installer?